M&CO. Royal Blue 3/4 Sleeve Cotton Button Front Top. Size 10. EXC. Buttoned breast pocket. 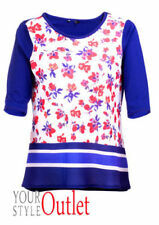 M&CO Royal Blue 3/4 Sleeve Top. 35" Chest, 23" Scooped length. 4 Buttons to front. White 100% cotton blouse with Broderie Anglaise and tiny bead detail. Tie at the back. Size 14. Used but in good condition. All proceeds to be donated to Farnham And Wey Valley Cats Protection. Please check out my other items all being auctioned to raise funds to enable us to help vulnerable cats like Stevie B ( see photo). New items added regularly. M&Co Summer Cover Up (Size 16) In White. Condition is New with tags. Cost £30 new. Dispatched with Royal Mail 2nd Class. Lovely top - another impulse buy!! Never worn! Ladies size 18 Cream Blouse By m&co. Condition is Used. Dispatched with Royal Mail 2nd Class. Green Cotton Sleeveless Tunic Gypsy Top Size 18 . Condition is good Used. Love this,sadly no longer fits. Dispatched with Royal Mail 2nd Class. Ladies 16 Blue Shirt/tunic From M&Co. Condition is Excellent- colour is pastel/denim blue . Dispatched with Royal Mail 2nd Class. Very good: item used, but no signs of wear, no splits, tears, fraying, colour loss or missing buttons etc. machine wash. top in a size 16, 40" bust and 23" shoulder to hem. lined with side zip. BNWOT: item appears unworn, no sign of use, still has that 'new unwashed' feel. SGUNNING LADIES WHITE LINEN SHIRT SIZE 18! . Condition is Used. Dispatched with Royal Mail 2nd Class. Goegeous little linen viscose mix ladies blouse sleeves can be worn up/down Perfect for s Summer Bust 44 Underarm to hem 14"
M&Co PLUS LOVELY BLACK AND WHITE ZEBRA PRINT 2 in ONE STRETCHY JERSEY TUNIC TOP. SIZE 18 ( GENEROUS SIZE 18). BNWT M&Co ladies white cotton shirt with pretty gathers on front and sleeve cuffs. Button front with ribbon trim and a spare button. Machine washable. 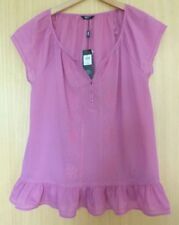 M & CO LADIES STRETCH TOP IN A SIZE 18. MATERIAL 100 % COTTON WITH A V NECK. ORANGE WITH BLUE AND WHITE FLORAL PRINT. LENGTH TAKEN FROM TOP BACK IS APPROX 59 CMS. M&CO SPIRIT CRINKLE COTTON / CHEESECLOTH TYPE OF MATERIAL. PINK WHITE BLUE. GOOD CONDITION WORN ONLY ONCE. Pink Flamingo T shirt from M&Co size 14. 2 Ladies brushed cotton shirts. Size 16 from EWM. From Edinburgh Woollen Mill. 2 ladies shirts, size 16 in brushed cotton. 1 is basically pink and the striped one is mainly green. Ladies Lovely ivory 3/4 sleevetop with V neck and front button fastening & pin-tuck stitching to yoke. Cuffed sleeve with button. By M&Co size 16. Very prettyM&Co Linen ( 55 %) t op. Gorgeous quality fabric.Hangs beautifully.Excellent condition. Lovely Long Length Shirt Blouse Size 18 . Condition is New with tags. Dispatched with Royal Mail 2nd Class.green and white stripe .only selling due to weight lose . Bnwt M&Co Ladies Cream Embroidered Sleeveless Top in cotton and viscose,size 20,Normally retails for £22. This item comes from a smoke free household,will be listing lots of clothing over the next few weeks,happy to combine postage costs but please wait for a combined postage invoice before paying. Please note we post on Monday and Thursday. 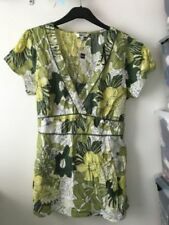 🌞 Ladies Summer Stretch Cotton Top By M&Co Petite - Uk:L/12-14? - Free Post! • M&CO PETITE - Ladies lovely, stretch summer vest top in good pre loved condition. Lovely pattern, ideal for the Summer months or hols? • Size: Large Petite. Possibly ok for 12-14? Pls compare measurements to your clothes, to ensure a good fit. Item measured on the back. • Underarm to underarm: 17” stretch to 20”. Neck to hem: 22”. 100% cotton. Washed/press on reverse to protect pattern. • Pls visit my shop if you have some free time, new stock has now arrived. Labels include: Vintage St Michael/Dash/Benetton/Genesis/Sweater Shop/Next/DAXON & More. Many items with free post option, good postage discounts where possible on multi buys. • Uk free 2nd class postage only. Thanks for looking. • Posting days are Monday/Wednesday/Friday. 1 x grey with navy blue hearts and the other is white with blue and yellow flowers. Short Sleeves, Stripe & Button Detail. Great M&Co Beige/Brown Striped Top. Chest 49" approx. - Length 27" approx. Ladies light cotton blouse/shirt, Size 10, M&Co. White with blue and green floral pattern. Long sleeved. Very good used condition. Thanks for looking! NEW, CONDITION ALL AS PER PHOTOS. 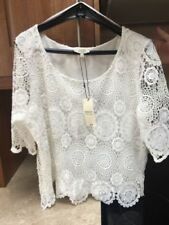 M&Co ladies cotton beaded top.